THIS IS NOT A LAWN MOWER, DISIGNED FOR CUTTING OVERGROWN WEEDS, BRUSH AND OTHER TYPES OF ORGANIC GROWTH TO A HEIGHT OF 3 1/2". USED TO CLEAR SMALL SAPLINGS 1 1/2" IN DIAMETER OR LESS. IT DOES NOT PROVIDE THE CUT QUALITY OF A FINISH CUT LAWN MOWER. 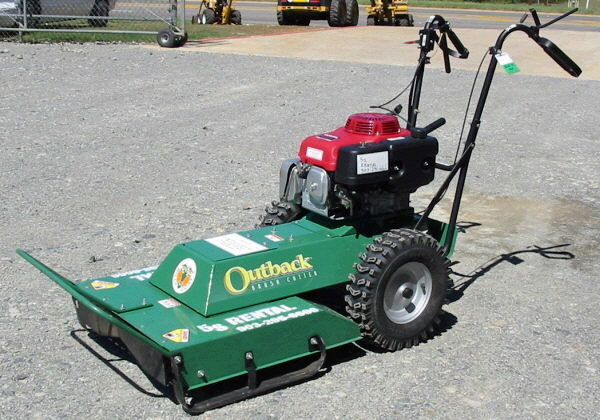 * Please call us for any questions on our mower brush cutter billy goat rentals in White Oak, Longview, Gilmer, Gladewater, Big Sandy, Kilgore, and all of East Texas.